LEXINGTON, Ky. (March 1, 2017) ― Six University of Kentucky educators were named recipients of the UK Alumni Association 2017 Great Teacher Award Tuesday night. Award recipients were honored at the UK Alumni Association Great Teacher Award Recognition Dinner last night at the Hyatt Regency in Lexington. They were also recognized during the Vanderbilt vs. Kentucky men’s basketball game last night. The Great Teacher Award, started in 1961, is the longest-running University of Kentucky award recognizing teaching. In order to receive the award, educators must first be nominated by a student. The UK Alumni Association Great Teacher Award Committee, in cooperation with the student organization Omicron Delta Kappa, then makes the final selections. Recipients receive an engraved plaque and a monetary reward. Andreatta is an associate professor in the Division of Communication Sciences and Disorders (CSD) and in the Rehabilitation Sciences Doctoral Program, both located within the Department of Rehabilitation Sciences in the College of Health Sciences. He is also a faculty associate with the Spinal Cord and Brain Injury Research Center at the UK Medical Center. Currently, Andreatta serves as the director of undergraduate studies for the CSD program and as the director of graduate studies for the Rehabilitation Sciences Doctoral Program. Andreatta is also director of the Laryngeal and Speech Dynamics Lab. This shared facility contains several specialized hardware and software systems for testing, recording and analyzing orofacial sensory perception, orofacial muscle force, vocal tract aerodynamics, and trigemino-facial brainstem-level evoked reflexes. Other capabilities of the lab include stroboscopic laryngeal imaging (ridged and flex-scoping), EGG, acoustic analyses of speech, and respiratory kinematics. Andreatta received his doctorate in speech physiology and neuroscience in 1999 from Indiana University, Bloomington. Postdoctoral work in animal laryngeal neurophysiology was completed at the National Institute of Neurological Disorders and Stroke at the National Institutes of Health, Bethesda. Pinto-Sinai is an assistant professor in the UK Division of Restorative Dentistry of the College of Dentistry. She received her dental training and DDS from the State University of New York (SUNY) at Buffalo in 2001. She completed a two-year general practice residency program at St. Francis Hospital and Medical Center in Hartford, Connecticut. After six years in private dental practice in New York and Chicago, she relocated to Lexington. She began her career as a dental educator at UKCD in 2009. After three years as a part-time faculty member she accepted a full-time position in 2012. She divides her time between clinical and pre-clinical instruction of student dentists. She is the course director for a dental simulation lab course which focuses on the restoration of teeth with dental crowns. She also continues to practice as a general dentist at the UKCD Faculty Practice Clinic. In addition to serving as a formal mentor to students, Pinto-Sinai is the faculty advisor for the Delta Sigma Delta (DSD) dental fraternity. She volunteers with DSD and the Hispanic Student Dental Association, both providing dental treatment and supervising student dentists treating uninsured patients at the Mission Lexington Clinic in downtown Lexington. Reese is professor and chair of the Department of Counseling, School and Educational Psychology in the UK College of Education. He received his doctorate from Texas A&M University in 2000. Reese’s research interests are psychotherapy process/outcome, psychotherapy supervision and training, and telehealth. His current research is focused on investigating the process of client feedback and the use of technology to provide counseling services to underserved populations. He currently serves on the editorial boards for the Journal of Counseling Psychology, The Counseling Psychologist, and Psychotherapy. Reese teaches Counseling Techniques I, Supervision and Consultation, and Practicum. His theoretical orientation is grounded in a psychodynamic-interpersonal process approach that draws upon cognitive-behavioral, solution-focused, and family systems strategies. He is a licensed psychologist in Kentucky. Sizemore is an assistant professor in the College of Arts and Sciences Department of English. She earned her doctorate at the University of Wisconsin. She received the 2015 Outstanding Teaching Award, with special recognition for excellence in teaching large courses. Her success in the large classroom has fostered shifted attitudes in the English department from initial concern about undertaking large lecture courses to a recognition of the potential benefits of such classes. Sizemore teaches American studies, English and social theory. Her academic and research interests lie in the fields of colonial America, literary theory, political theory, time studies, affect studies, literature and para-religion, and literature and science. Vanderford is an assistant professor in the Department of Toxicology and Cancer Biology, assistant director for research in the Markey Cancer Center and assistant dean for academic development in the College of Medicine. He earned his doctorate at the University of Kentucky with a postdoctoral fellowship at Vanderbilt University. Vanderford’s research interests include epidemiology and molecular etiology of lung cancer, research administration, technology transfer and entrepreneurship, and science pedagogy and career development. One of his most recent publications (in the Journal of Research Administration) detailed a case study at the University of Kentucky Markey Cancer Center focused on enhancing faculty productivity through a centralized communications and project management infrastructure. In another article published by Science in July 2016, Vanderford described the unusual paths he took to secure a nontraditional faculty position at UK. Vanderford secured his initial opportunity at the Markey Cancer Center as a science writer and editor and, from there, he took on leadership roles that contributed to his transition into a unique tenure-track faculty position. Zeadally is an associate professor in the School of Information Science in the UK College of Communication and Information. He has edited or authored six books as well as over 20 international peer-reviewed international conference or workshop proceedings, authored or co-authored more than 277 refereed publications including 164 international peer-reviewed journal papers and 32 refereed book chapters. He has also co-guest-edited over 30 special issues of international refereed journals. Zeadally is the editor-in-chief of two peer-reviewed international journals. He also currently serves as associate editor or editorial board member for more than 25 international refereed journals. In addition to a 2016 University Research Professor Award, in the last five years, Zeadally was the recipient of one other university award, 11 international awards and two national awards. He earned his doctorate in computer science at the University of Buckingham, England, and conducted postdoctoral work at the School of Engineering at the University of Southern California, Los Angeles. He joined the faculty of the UK School of Information Science in 2013. Zeadally’s research focuses on computer network and information security. 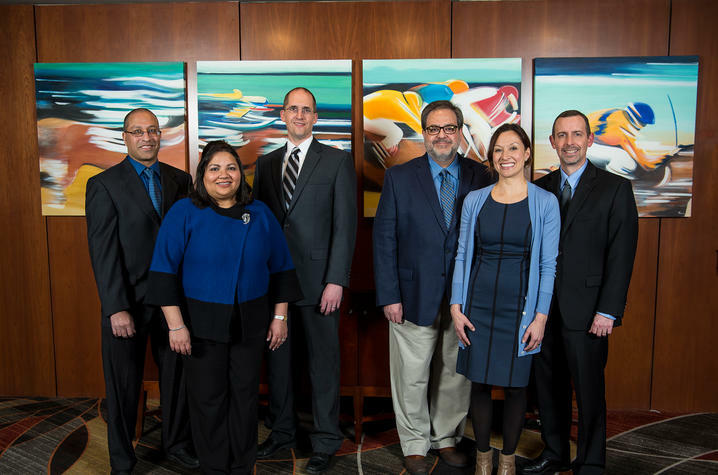 The 2017 Great Teachers (L-R) Sherali Zeadally, Gitanjali Pinto-Sinai, Nathan Vanderford, Richard Andreatta, Michelle Sizemore, Jeff Reese. Photo by Tim Webb.